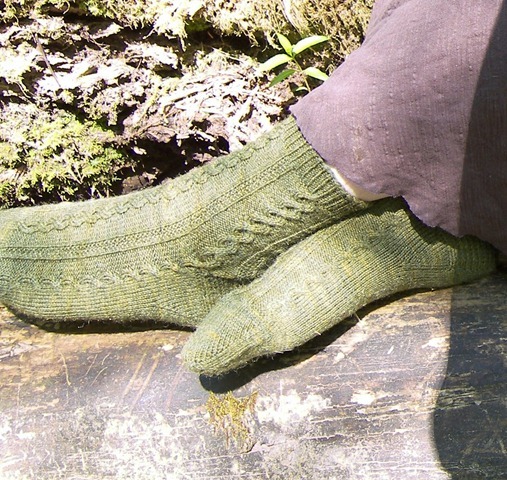 Danu, a classy cable-rib sock with easy cables and moss stitch accents. 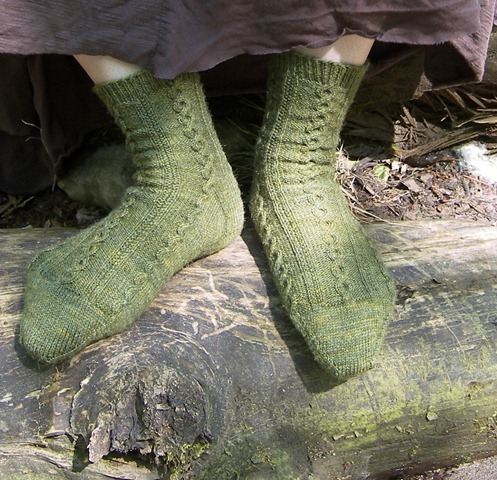 These socks were inspired by stories of the Tuatha Dé Dannan (“people of the goddess Danu”) who ruled Ireland until they were driven to the Otherworld by the Gaelic Celts. 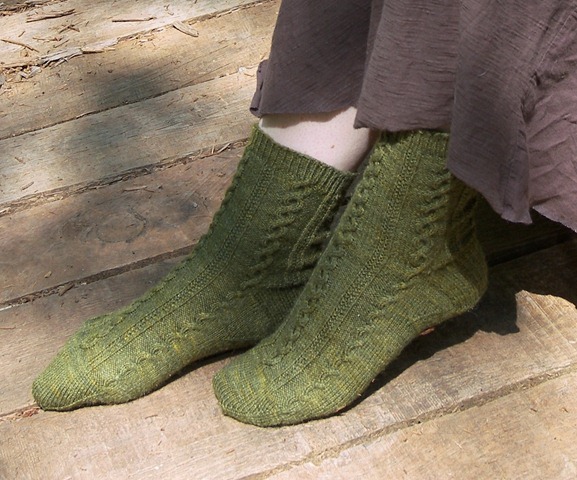 Worked top-down, the socks feature bold cables, for the warriors, and subtle moss stitch columns, for the tricksters. At the heel, two of the cables split and continue down the side of the foot, merging the patterned instep with the plain sole. 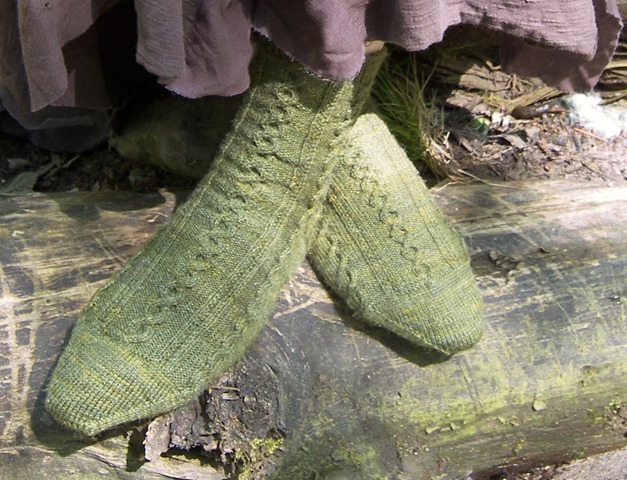 The gusset decreases are placed at the bottom of the heel flap instead of the top so that the side cables can use the gusset stitches in their twists. 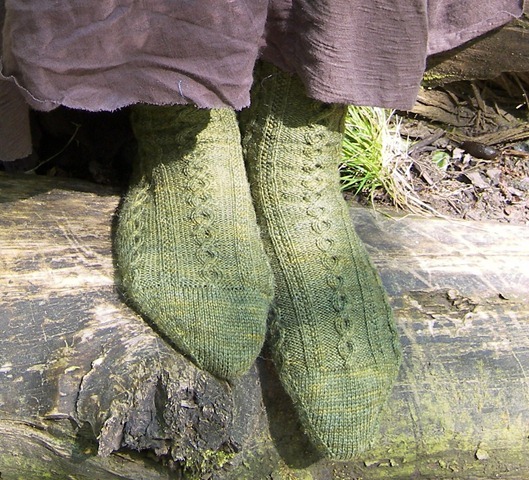 With an easy-to-memorize pattern and slightly unusual construction, these socks may even have some of the magic of the Tuatha Dé Dannan still in them. At the time I designed these, I was reading a book by Juliet Marillier whose writing I adore. She specializes in historical fiction with a healthy dose of ancient folklore/fantasy. Reading a story set just after the Tuatha Dé Dannan’s withdrawal to the Otherworld might have influenced the name of the pattern. Maybe. I’m pretty excited that Danu is one of the pictured patterns in the table of contents. 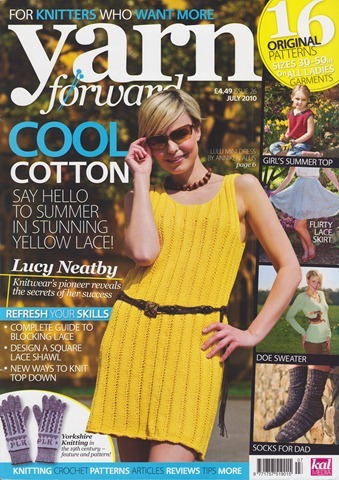 The contract Yarn Forward has with their photographer doesn’t allow for third-parties to post their pictures, so you’ll have to look at the magazine to see it and the other great photos. The ones above are pictures that I took at a stream near my house for the submission. My camera doesn’t have a remote, so these were taken (like the Arthurian Anklets) by setting the self-timer and dashing into a pose while trying not to get any detritus on the socks. Actually, these were taken just down the path from the pictures of the Anklets. That park is wonderful for “wild” sock pictures. When they send the socks back, I’ll take some more (read: better) photos with Lowell. Congratulations! I got this issue a few weeks ago, and was excited to see your great design in print. If I understand, you forgot to work the first 8 stitches of the round before the heel flap? If that’s the case, then the cables won’t line up when you start the instep instructions. 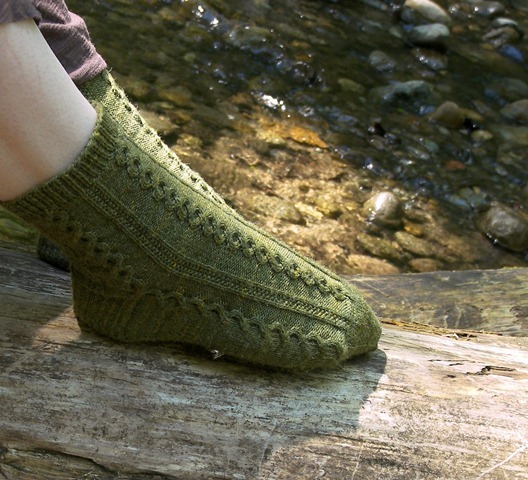 You can follow the “leg pattern” instead of the “instep pattern” stitches, which should line up the cables, but won’t have the centered, symmetrical look with the cable down the center. I can’t think of a way to line them up (centered, etc) without ripping back the heel flap and setting it up according to the instructions. Having to rip back happens to us all- it’s a law of the universe, I think.